Little Page Turners: Star Jars: Cure for Complaining! 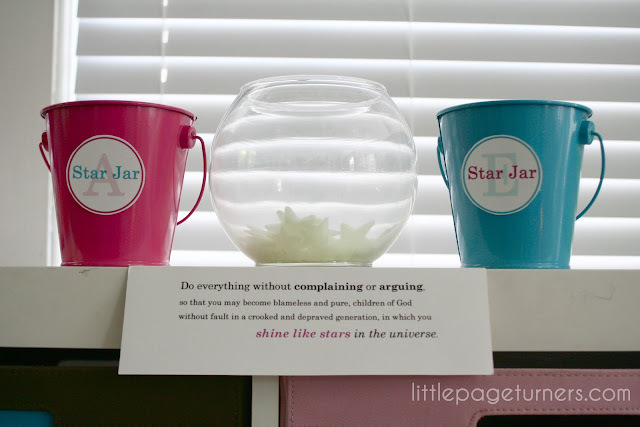 Star Jars: Cure for Complaining! Okay, so "cure" might be overstepping it a bit, but this has been a great method at controlling the amount of complaining that goes on around our house. 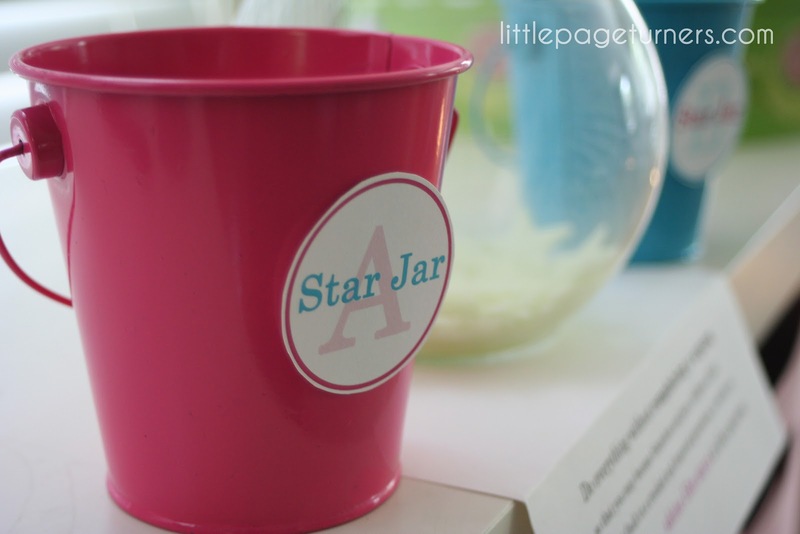 Each child is given their own "star jar" - in our case, little buckets from Target's dollar spot that I attached their initial to. Every time I catch them doing something without arguing or complaining about it, they get to put a star in their jar. They are not allowed to ask (or hint) for a star, and they're more likely to get one by doing their chores without being asked. I also award stars when I catch them being kind or helpful. 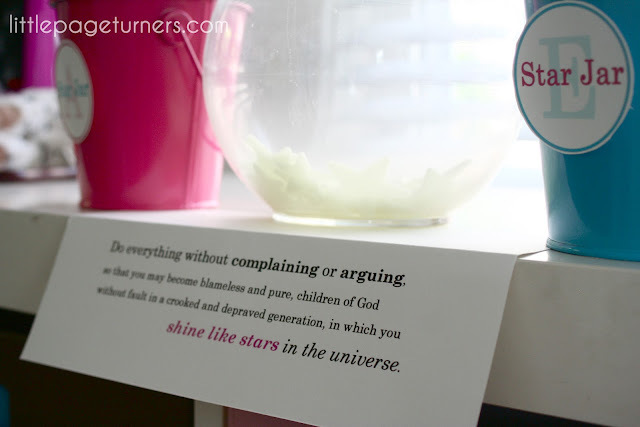 Beneath the jars is a print out of Philippians 2:14-15... a constant reminder of WHY they're to refrain from complaining and arguing (besides just to save Moms' sanity)! The girls absolutely love their star jars. We've been doing it for nearly a month now, and it's still a success. They're in a bit of a competition to see who can earn the most stars. 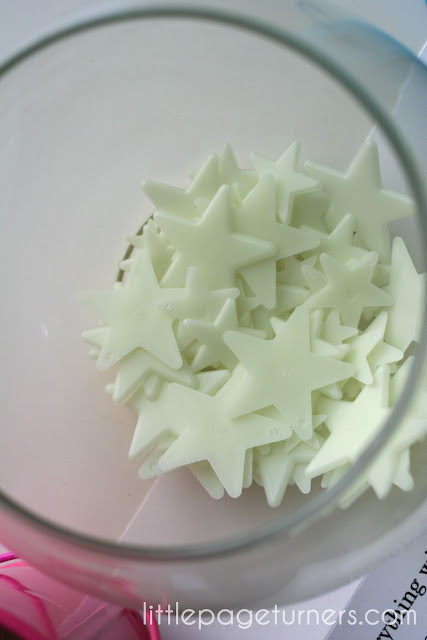 When the main jar is empty, they will each get to pick where on their bedroom ceiling the stars they earned will go. I have a feeling the space above their beds will be crowded with stars! What a Lovely idea!!!! It is going to be so special to see all those stars twinkling above their beds!!! What a great way to work on not complaining. I love the inspiration message you have up for the girls too. Great idea! I'm going to have to give this a try with whining. That's an issue we're working on with our 2 year old. 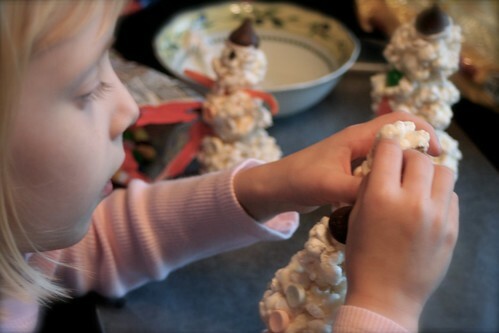 It might be better to use M&Ms for her since she's so young... Thanks for getting my wheels turning, though! I just bookmarked your blog and pinned this post - can't wait to come back in the future.